Even if you faithfully brush your pet’s teeth, we cannot overemphasize the importance of regular dental cleanings. 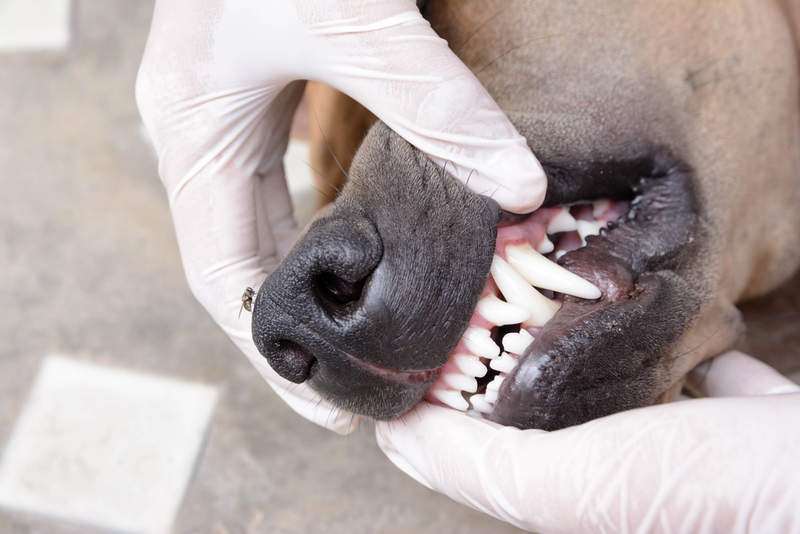 Dental disease—the most common clinical condition to affect pet dogs and cats—can be devastating to your pet’s health. The good news is that dental disease is completely preventable with routine oral hygiene and professional dental cleanings. When your pet has a dental cleaning performed, you likely drop her off in the morning and pick her up at the end of the day with fresh breath and sparkling teeth. But, have you ever wondered what happens in between? Read on for a description of a complete dental cleaning procedure. You’ll be surprised how similar it is to your own dental experience! One major difference between a human and veterinary dental cleaning is that a veterinary dental cleaning requires anesthesia. Without anesthesia, it would not be possible for even the best-behaved pet to stay still long enough for a complete cleaning, parts of which can be painful. Anesthesia is also necessary for dental X-rays to be obtained prior to cleaning. To ensure your pet is healthy enough for anesthesia, a thorough examination is performed. Your veterinarian will pay particular attention to your pet’s heart and lung function. Since not all organs can be assessed by palpating and listening, preanesthetic blood work will be performed to check their function. Most importantly, the kidneys and liver are checked to ensure they are in good working order to metabolize and eliminate the anesthetic drugs used. Once your pet is cleared for anesthesia, drugs will be given to make her unconscious so she can rest comfortably during the dental procedure. After she loses consciousness, an endotracheal tube will be placed so oxygen and anesthetic gas can be administered. Throughout the entire procedure, our veterinary team closely monitors your pet’s anesthetic depth and vital signs to keep her safe. Dental radiographs—or X-rays—are often taken before a dental cleaning. Since visual inspection only allows for examination of the crown—or upper portion—of the teeth, radiographs are taken to evaluate the tooth root and surrounding bone. Dental disease starts below the gum line, so a tooth’s crown can look completely healthy while the root and surrounding bone are deteriorating. If the tooth root has extensive damage, extraction may be necessary. Following a visual exam, an instrument called a periodontal probe will be used to check the health of the structures that attach the tooth root to the bony socket it fits into. Damage to the periodontal ligament and surrounding bone indicate advanced dental disease and the possible need to extract painful teeth. Tartar that has accumulated on the crown surfaces will be removed using ultrasonic and manual scalers. Ultrasonic scalers use high-frequency vibrations to break up tartar, or calculus, and remove it. After all surfaces have been cleaned by the ultrasonic scaler, stubborn tartar that remains in crevices or between teeth can be scraped away with a manual scaler. Plaque and tartar that develop below the gum line pose a larger threat to dental health. They harbor bacteria that cause degeneration of the periodontal ligament, causing periodontal disease and tooth loosening. If plaque is removed from below the gums during the early stages of dental disease, minor damage to the periodontal structures is reversible. If allowed to progress, periodontal disease becomes irreversible, and significant inflammation, pain, and tooth loss will result. The instruments used to remove plaque and tartar leave microscopic etchings on the tooth surface. If not smoothed out, these scratches in the enamel provide ideal places for bacteria to settle in and start creating new plaque and tartar. All surfaces of the crown are polished to smooth out the enamel and discourage tartar formation. At the conclusion of the procedure, polish is rinsed away from the teeth. A final visual inspection will confirm that all tartar was removed and the teeth are clean. A fluoride treatment may be applied to the teeth to strengthen tooth enamel. Sometimes, a dental sealant is also used to discourage plaque and tartar formation. After the cleaning is complete, we will continue to monitor your pet as she wakes from anesthesia. When you pick her up, she’ll have a fresh, clean mouth. Questions about scheduling a dental cleaning for your pet? Contact us today!